The Polish anglers finished their Thailand fishing holiday with a visit to IT Lake Monsters. On arrival the anglers began fishing with lures and were soon hooking up with Alligator Gar and Pacu. Sport was hectic with the predators in a particularly hungry mood. A changeover to bait in the afternoon saw the anglers starting to get amongst the better stamp of fish. 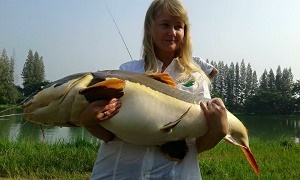 The Redtail Catfish continually homed in on the free-lined mackerel fillets with numerous specimens landed to 40kg’s. In addition to Redtail Catfish the anglers also landed bonus Giant Snakehead and Sorubim as well as more Alligator Gar and Pacu. At the end of the days predator fishing trip to IT Lake Monsters, the anglers had amassed an eighty plus haul topped off by some quality Redtail Catfish.